Some of Schumann's best loved tunes in a masterful arrangement, as recorded by The Lyric Guitar Trio on the Crotchet Factory CD Scenes. 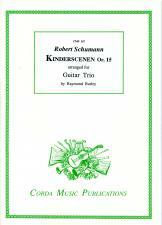 Robert Schumann's Kinderscenen (Scenes from Childhood) op.15 was written in 1838 for the piano. In making this arrangement for three guitars I found it necessary to transpose the majority of the movements to more accommodating keys. In the posthumous piano edition - published under the direction of Schumann's widow Clara - many of the original metronome markings were altered - in some cases, quite considerably. In the present edition the first of the two tempo indications, shown at the beginning of each movement, is the composer's marking, the second is my own suggestion relating specifically to the guitar version. Schumann's marks of phrasing and articulation are included in the parts; the phrase marks have been omitted from the score to avoid cluttering the smaller notation. Schumann often failed to cancel deviations of tempo (rit, ritard, ritardando, etc) - normal tempo is to be resumed at the beginning of the following phrase.